If you’re an avid deer hunter, chances are you have some very specific gear. A firearm of some sort, of course, but also a camouflage outfit which allows you to traverse through the woods unnoticed by your prey. And then, as seen below, you douse yourself in day-glow orange. It seems counter-productive, right? The goal of the camo is to blend in — but the orange hats and vests seem to undo all of that. What gives? The reason is simple: it saves lives. 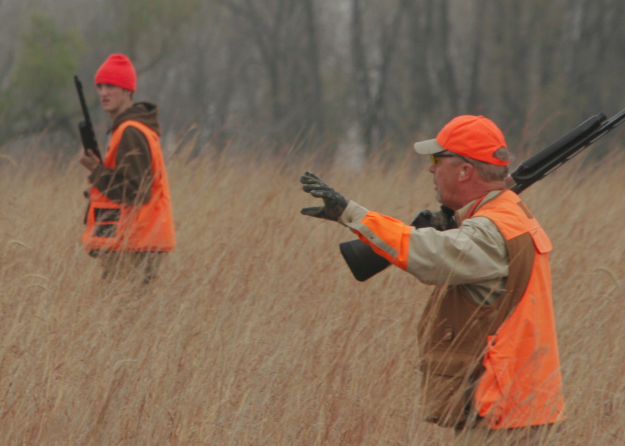 In 2013, the Minneapolis Star-Tribune (where the image above comes from) reported on the effects of orange safety gear and better training: “Nearly 14 people a year were killed in firearms-related hunting accidents in Minnesota between 1961 and 1970, and an average of 95 hunters per year were injured. But over the past decade, an average of two hunters per year have been killed and 23 have been injured in hunting accidents.” So, yes, the law works. And yet, some hunters are reluctant to don such a vibrant color while out hunting deer. If orange hats and shirts help other hunters see one another, doesn’t help the deer notice them, too? It turns out, no, it doesn’t. To the deer, an orange-clad hunter looks as camouflaged as one in army fatigues, as the state of New York demonstrates below. So it makes a lot of sense for hunters to wear orange — their fellow hunters can see them, but the deer, not so much. Bonus fact: If you want to find someone wearing camo, you may want to dial up one of your friends with red-green colorblindness. According to a 2006 study, as reported in Discover Magazine, researchers asked subjects “to rate the similarity of 15 circles painted in tones of khaki.” What they found was that “people with regular vision struggled with the test, while color-blind men aced it.” In other words, the colorblind had little trouble picking out patterns which, to those with typical vision, appeared to be camouflaged. From the Archives: Razzle Dazzle: A unique form of naval camouflage.